A little while back I read a post over at IfItHitstheFan.com concerning a recommendation on where to spend $900 on survival & preparedness preps. There are many people across this great country that are just now seeing the light and beginning there preps. For many of these newcomers the question of where to begin is ever present. Some people are taking things serious and are willing to sink some serious change into their preparations – so I figured I would throw my 2 cents in. For someone relatively new to the prepping scene and having no purposely stocked supplies – a $1000 can go a long way. Food ($350) – this has to be the priority. Purchase in quantity what you normally eat. A good idea would be to sit down with a notepad and pen and meal plan for 2 weeks. Remember that there may be no electricity so all food items in the meal plan have to come from the pantry. Next – take that 2 week meal plan and make a list of all items and use that as your shopping list. If you are able to buy 2 of everything listed – that would be a one month supply. Take into consideration any supplies such as cooking oil that you may need to complete the meal. Don’t forget about spices and other condiments. Lastly – do consider shelf life (often on the package) as well as buying store brands and buying on sale to maximize your available funds. Water ($50) – You have to have it. Buy the basics – gallons of spring/drinking water. These can often be had for less han $1.00 per gallon. Save soft drink containers, rinse them out and fill with tap water (mark with date). Buy a few cases of bottled water. Light ($50) – In the dark – you will wish you had it if you don’t. Pick up a lantern-type flashlight of the larger variety. Get extra alkaline batteries for all. Medical/First Aid ($40) – ‘Stuff happens – be ready. Make sure you are up to date on all prescriptions. Get a decent first aid kit – usually around $10.00 . Pick up extra supplies like common band-aides, burn ointment, diarrhea medicine, pain killers, triple antibiotic, cold medicine, etc. Alright – up to $490.00………….$510.00 to go. Misc Household Supplies ($60)– This category covers a lot. Here is a chance to stock up on cleaning supplies as well as some sanitation. Include a large variety of solutions for washing clothes, disinfection, as well as personal items such as deodorant, shampoo, soap, hand sanitizer, shaving creme, and razors. Self-Defense ($200) – If you do not have the ability to defend your family and supplies – you may up with neither. $200 can work to get yourself a firearm to defend yourself – as well as possibly put some meat in the pot. Check out the used gun selection at your local pawn and gun shops. You may be able to pick up a decent shotgun as well as some shells for it for the budgeted $200. Another consideration may be getting a decent rimfire like the Ruger 10/22 along with a brick of ammunition. I know, I know…..it is not the best gun for defense – but we are on a budget here. Alternative Power ($50)– With an initial investment in supplies of $1000 – you can only do so much. Stock up on batteries for all battery powered items you have and will need. Try to standardize your electronics so you only need a couple of battery sizes. Look for the best deal on batteries – and stock up. Alkalines are much better than standard heavy-duty. Rechargable can be good – if you have a method of recharging them. Fuel ($50) – Stow away some extra gas for your vehicle and propane for your grill. 10 gallons of gas right now is running around $35.00 . Getting a 20-lb propane tank filled is costing around $15.00. Knowledge ($) – Get on the ‘net and start printing. Sure – you can buy books – but if you are on a budget just start printing stuff off the Internet. Place printed subject matter in categorized binders and folders. Store some of the material that is most important in large Zip-loc bags. Practice some of the skills that you think you might need – like firestarting. Methods for Heating ($150) – Getting cold out? You’ll be glad you spent some money on this catagory. Depending upon your region – being able to get warmth in the winter may be critical. One possibility is to get Kerosene heaters and then stock up on fuel. Stock up on gloves and thermal underwear. Already have a propane heater? Get more fuel. Well – that’s $1000.00 dollars. This list isn’t best for anyone – just to promote some thought. If someone already has a defensive firearm – that money can be spent somewhere else. Same goes for every other category. This kind of thinking can be fun – and get you thinking about your own preps and where YOU might spend $1000 if you you came into it. Well done Rourke…..that is exactly the way I would do it. At this (late) stage in the game, I would even take the money out of a credit card and get things in place now. Just think of all the useless stuff we buy everyday, and use that credit to buy something with some true value and substance. I think you hit a home run with this list. I would have put knowledge as “Priceless” but other than that you have spent your money wisely. I think you have put the right amount of money when it needs to go. Thanks for the plug! I think you have a really sound list of suggestions here. In some ways, $1,000 seems like a lot of money all at one time, but then you figure, for a lot of people, that doesn’t even make two car payments, or one mortgage payment. I recently found out why my friend had the $900 figure to go with – he had sold a .45-70 rifle. Yeah – $1000 can be spent so easily. Good post. Now for all of us who have done this already. What about the next grand. Im bout on my 3 or 4 thousand due to my firearm selections. I just wanted to let everyone know to wife is on board now too! Yeah. The whole family is actually going to gun range this weekend for some practice. Rourke ill let you know how the mp22 does n take some pics. 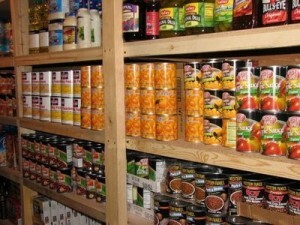 Yesterday I spent all day with wife setting up pantry after buying some nice shelves at menards. Wow what a difference when you can see all your food organized and layed out. Really let’s you know what you low on or have more than enough of. Before we were just kind tossing stuff in bins. I love new system we have plus its just nice to look at from a preppers view. Take care all! Congrats on getting the wife on board. I am struggling with mine. I see a sequal in the works for the next $1000 or so. 1. staying or going? Assumed we are staying, so weight and carrying capacity aren’t a problem. Deodorant? Really? If the answer to question 1 was ‘going,’ would you have bought it? Then put this item on the next $1000 list, not this one. Water – I didn’t see any mention of bleach. A gallon of bleach (with mixing instructions in a ziplock bag) will give you about 5,000 gallons of drinkable/cookable water. 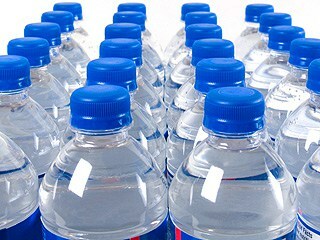 Do you have containers for the prepared water? Half gallon clear plastic juice drink bottles, when washed, can store your water for nearly free. Under food – don’t forget – if your favorite storage item requires lots of preparation, forget it. Next, if your supply of food takes lots of water to make, add that to the water needs list. Misc. household/cleaning supplies: If your water supply is turned off due to a power outage, let me just say you will want a large bucket with a portapotty lid and lots of plastic trash bags and toilet paper. If the water supply is working, but contaminated, then the bags and toilet paper will still be useful for lots of things…well, the bags at least. the TP will become a local currency. Fuel: All that food, some of the water, and how are you going to cook all of that? what stove, placed where, and fueled by what? If you think you’ll barbeque all your meals, don’t forget the two other things you’ll need for that – weather protection (I’ve learned to cook with an umbrella in one hand); and “vermin” protection. Humans, with our poor sense of smell, can still smell food cooking up to a mile away. You’ll need that self-defense item to keep the two-legged rats at bay. Sorry for the long reply, but your list provoked a lot of thoughts. I’ll stop at this for now. I didn’t want to make the post too complicated to be honest with you. about stove and fuel. There are five forever fuels, meaning they never go bad. propane, kerosene, solar (ovens are easy and cheap to build), coal, charcoal if kept dry. Great post, Rourke. You gave some wonderful examples to get people going with preps. I would also encourage people that, if they had some money left over from food purchases, to spend some of it on water purification methods. Such things to consider would be a good name brand water filter or even some plain chlorine bleach. In a true SHTF scenario and if bugging out, being able to purify water on the go or existing water supplies is uber important. Taking water with can be a heck of a lot to carry! Thanks for the site Rourke and all you do! Water purification is critical in a long term situation if a potable source is not availabble. Good breakdown for the $1000. But I think one of these days you need to more realistically address the idea of self defense. While recommending a shotgun for self defense, I do not think the majority of your readers will have the will to kill someone with it. Ever see what a shotgun does to a human? I have. Not so nice. Sure it is better than dying yourself, but that one act will change everything. A shotgun can have a devistating effect on the human body – as well as a deer, rabbit, turkey, etc. I am not totally sure what you are saying….but I think I do. If someone has to take action to defend their family or themselves – they will have to deal will the consequences of doing so – which may not be very pleasant. I believe the alternative would be worse. Either way – not good. The emphasis or recomendation of a shotgun is basically the amount of firepwer you can get for the money. I have seen what a shotgun can do – I will leave it at that. Thanks. Sootch has a great channel. Glad you are here! I would not spend so much on stored food and spend some of the money on long term. I know that this is supposed to be for someone just starting but if whatever happens doesn’t happen in the next six months then this would be a wise investment, especially this time of year. Since I’m assuming the person has never grown a garden, buy a six pack of tomatoes. Find some end of year sales on bare root trees and buy some trees. A couple years ago I purchased 5 fruit trees for $20 at the end of season clearance. Most of the home improvement stores are selling a dozen asparagus plants or a dozen strawberry plants for under $5. Include one bag of amendment. For around $30 of your $350 dollar food investment you will get food production that will last you for the next twenty to thirty years. The reason for the expense on food is if something happens soon – you are going to need it. Long-term storage foods such as freeze dried are not preferred – at least to me. Storing what you eat and eating what you store is a preferred method.Once a good years supply of common foods are stored – then go the long-term route.Of course – it is up to the buyer. Good points on gardening and planting. YouTube has some great videos on how to get plants for free by sprouting seeds from food items. It would be a fun, low cost project to try anyway. You can also try rooting cuttings from plants. What about a small stove …say maybe a campstove as you need to cook. Or a dutch oven if you have a wood heater. Assuming no electricity. Good ideas. I have seen a stove that can be used for cooking and heating on Amazon – runs on wood – for $69.00 . Shipping is pretty stout but I want one. One of my frustrations has been rotating the food supply. Most store bought food has a shelf life of 2 years or less. My husband and I recently went on the Nutrisystem diet (and are doing well with it, thanks). We thought that being at a healthy weight would help us be more mobile and able to work with fewer calorie demands. One of the surprising things I found out is that their food has a 15 year shelf life. So we are saving an extra month (and more) of ready to eat bars or cans that can be boiled. Having such a long shelf life makes my life easier as I don’t have to worry about rotating so much. The food is smaller too so there’s more room for water in there. Our food is stored in a lead safe should fire or radiation be part of the picture. All your efforts will be for nothing if your food supply is not stored properly. I also don’t expect to lead the life I have now if/when TSHTF so deodorant, shaving, and other household supplies are out. Civilization survived for centuries without bathing and water is likely to be at a premium. Great post Rourke! You actually stretched that $1000 pretty far. Much further than most of us would if we just started hitting stores without a plan. In the water department I would tell people to Google “Monolithic Dome Water filter” and check out the ceramic water filters. They are inexpensive (I think I paid $60 for two filters, filter socks, and spigots – enough to make two water filters) and easy to put together. The Texas Baptist Mens Water Ministry sends these filters to disaster sites all over the world. Thanks for all the information. Great post Rourke. First aid and ammo here. as well as new water filter cones for the big Berkey. I have one, and keep it with my emergency supplies. A hidden advantage of this radio/light is that it gives you something to “stay occupied” in an emergency by cranking the radio to keep it charged. Repetitive motion will help you keep your head clear and focused during stressful situations. Good thought on that radio. Bill G: In my opinion, the best barter item you can get is coffee. Personally, I can’t stand the stuff, so I wouldn’t mind parting with it, especially if it’s in exchange for water or food. I know the people I work with would go crazy if they can’t have their morning cup of coffee. Unopened coffee cans and vacuum sealed coffee beans should have a shelf life of about 2 years, from what I’ve read. Have to agree, well done. Here is my dilemma right now. We all know that you should “store what you eat”. Well my wife and I have gravitated to a “whole foods” diet. FRESH meat, fish, veggies, salad, etc. NO PROCESSED FOOD WHAT SO EVER! The ONLY grain she will eat is rolled oats. NO rice, NO beans, NO wheat (unless it’s 100% STONE GROUND whole wheat), barley etc. I admit we are much healthier for it, but how do you store food when this is your diet? I think the only logical answer is that you live a homesteading lifestyle – on a farm with fresh veges, fresh meat, etc. If this is not an option – after TSHTF – sacrifices will have to be made. You may have to go to a different diet in order to survive. If I find out anything else will let you know. You might want to look into aquaponics as a way to raise fish and at least some veggies. Also home canning will allow you to control ingredients – I’m afraid you will have to rely at least in part on canned, dried/smoked foods in a shtf situation. Also try growing your own grain now so when shtf you will have some idea of what you’re doing. Get a grain hand mill. Try some other grains i.e. amaranth, buckwheat,sorghum. Food: As others have pointed out, you’ll want some sort of camp stove. If your local area has Asian markets, look for butane stoves. At my local Asian market, I can buy a butane stove for about $15, and a four-pack of 8-ounce butane canisters (they look like aerosol cans without the spray nozzle) costs $5.49. While butane is an ineffective fuel below freezing (the gas won’t vaporize in the canister), butane canisters are lighter than propane canisters (propane requires heavy-gauge metal), and butane stoves are more stable than most inexpensive single-burner propane stoves. Water: Your budget will go farther if you minimize the purchase of bottled water (I’m referring here to flats of 16.9-oz or 20-oz bottles) in favor of bulk storage. Also, calcium hypochlorite (used for pool chlorination) has a much longer shelf life for water purification than does chlorine bleach. Either way, make sure you know how much chlorine-bearing compound to add to a given amount of water. Finally, clear bottles made of PET plastic can be used in solar disinfection of water; 2-liter or smaller bottles are more effective. Light: As others have noted, hand-cranked LED lights are a good way to ensure that you always have a light source. Candles are an inexpensive source of light (I just bought 16 tea candles for $1 at the local Dollar Tree), but using candles does increase the risk of an unwanted fire. On the Gripping Hand, candles are pretty effective as fire starters, if you need to get wood burning quickly. Miscellaneous Household Supplies: Don’t forget to stock up on whatever feminine hygiene products your household may need. If you’re a single guy living alone, you still might want to add something along these lines as barter material. Self-Defense: If you only have $200 to spend on a firearm, one option that will give you flexibility at the expense of capacity is the various combinations of the Rossi Matched Pair, which offer swappable single-shot rifle and shotgun barrels (I routinely swap barrels in well under one minute). I picked up a new-in-box “youth-sized” Rossi Matched Pair in .22LR/20-gauge for $130 (sales tax included). With shotgun slugs running at just under $1 per round, and .22LR available locally at under $20 for a box of 550 or so rounds, my Rossi Matched Pair gives me a reasonable option for self-defense, small-game hunting and hunting game up to deer-size. When shopping for self-defense shotgun shells, keep in mind that birdshot is not reliable for self-defense, as birdshot is unlikely to penetrate far enough to stop a man-sized target. Buckshot and slugs are both more likely to disable a man-sized target. Knowledge: Consider storing electronic references on thumb drives in small-scale Faraday cages. If you insulate a thumb drive (or other electronic device, such as a netbook) from contact with metal, you can use an all-metal trash can (including a metal lid) as a protective Faraday cage, thus protecting your electronic devices from EMP. Methods for Heating: For indoor heat when the power’s out, propane catalytic heaters are a good choice. While they’ll consume oxygen, they don’t produce as much carbon monoxide as flame-based heaters. In either case, you’ll want to have some ventilation from outside. Hanging cheap blankets as baffles will help reduce the area you’ll need to heat, while still allowing enough ventilation to prevent oxygen depletion (the 1500-BTU Coleman SportCat propane catalytic heater recommends at least six square inches of ventilation). Good advice! By the way,the 10/22 is the one I would grab if/when I have to bug out…I have told alot of people that it is a very good all around “survival” gun……sure its not perfect but then what is? I have killed dozens of deer and turkey with one…I can promise you that if I used it against a person in a fight they wouldnt be thinking I was underarmed and when in a Shtf/survival situation the idea would be to carry a light dependable weapon,just my 2-cents worth…..thanks! I would say that both water and food are necessary for life, but water is the FIRST thing to worry about. 1) individual bottles of water are usually way overpriced, but the real problem is every bottle I’ve ever tried “shrinks” over time. I don’t know why, but it concerns me, because either the amount of water is decreasing, or some chemical reaction is occurring. 2) you can’t store “lots” of water, so water purification is a critical concern. Bleach is good, but has a short shelf life. 3) Look into an “aquapod” for each tub – when disaster happens, the first thing is to fill it/them with water before it stops flowing or becomes contaminated. Buying a gun is a waste of money – unless you buy ammo to use and ammo to practice with and take the time and expense to learn to use it. The 12ga shotgun is the most versatile, which with the right types of ammo can be used for hunting anything and defense. It’s weaknesses are it is strictly short range, can have severe recoil, and the ammo is big and heavy. 22LR is cheap, small, light, quiet, and quite good for small game hunting, but is very poor for every other use (except training, practice and even “fun”). I would be reluctant to have it as my only gun. I would say that any First Aid kit which only costs $10 is not going to be worth much in a disaster situation. You want a kit with a larger supply of minor supplies, and some more advanced stuff. Gasoline breaks down quickly. Make sure you add something like Sta-Bil to it for long term storage. Really, a good list. I love the outline of how much in each category. I’d make some adjustments. We also favor headlamps over flashlights in our house. I highly recommend moving away from battery light. You can pick up a bunch of solar lights for $1-5 each. If you have a clear gallon bottle, you can bungie one light on the side and make it into a lantern. If you go with batteries, only buy rechargeable (with a solar recharger). I’d put the money into a small, backpack solar charger. If you haven’t cooked over a campfire in a long time, I suggest taking a few nights this summer to practice. It isn’t as hard as it looks. Forget the gallon water bottles. I did that for two years and they, eventually, decay and leak. Invest in some good containers and fill from your faucet. Yes, most US drinking water tastes terrible, but is safe. I also fill old fruit juice bottles with water and keep them near the toilets. Different containers for different uses. And unscented bleach is cheap right now. Personally, I don’t do guns. I go for a good pepper spray. I have also thought a great deal about indoor shutters. My family lived on the plains as pioneers, use their ideas! The library (mine is fantastic) and your community college are both great sources for knowledge. I download things to my rechargeable Kindle. I agree with learning how to garden- but growing all your own food is pretty far fetched. It is worth going on a canned food taste test to see what you would like long term. You do not have to buy “processed foods”. There are great selections out there. I’ve been in a situation where food became scare- suddenly all the “health requirements” disappear. Great list, Rourke! Personally, I would add seeds and iodide tablets for ltu. Also a solar light called “luci”- they float and my friend swears by them in a power outage. Try to find a home with a wood burning fireplace or stove for heat/cooking. More than $1000, but if you’ve ever lost power in the winter it’s worth looking into. With my “$1000″ I would look into getting an rv/skoolie (at least the down payment) to customize. Then to get either a parcel of land or renting a space from a fellow Prepper with a farm. (Hey, I can dream, can’t I ?” Lots to think about. I would also add either whiskey or vodka. It can be used to make water potable, make herbal tinctures, sterilize wounds, fire starter, barter item.